Cancer Center of Kansas was named the Favorite in the category of Hospital for Cancer Care in the 2016 Wichita Eagle Readers’ Choice Awards! 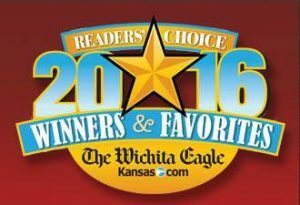 The Readers’ Choice is a compilation of the Winners and Favorite Businesses chosen buy the readers of The Wichita Eagle and Kansas.com. Thank you to all of our wonderful patients! We continually strive to bring Kansas the best health care possible with respect to oncology and hematology.